any person seeking public office must speak fluent Gaelic in order for them to be able to speak with and listen to their potential constituents. The tour guide in Killarney explained why so many places in Ireland begin with “Bally, Kil, Skellig and Cloch”. Ciarrai = Ker = County Kerry meaning the place of the people of Ciar. Bally=Baile which means homestead of…. “Beyond the Pale” came from the 1169 British Invasion of Ireland. Local people who lived in land beyond the scope of the British reach were said to live Beyond the Pale. He who runs away lives to fight another day. This saying obviously came into being when the Gauls, Vikings, Pict’s, Anglo-Saxons, Romans and other invaders showed up on Irish soil. A new broom sweeps clean, but an old one knows the corners. Ah, a phrase where we only use the first half. It means a broom that is broken in is more flexible. 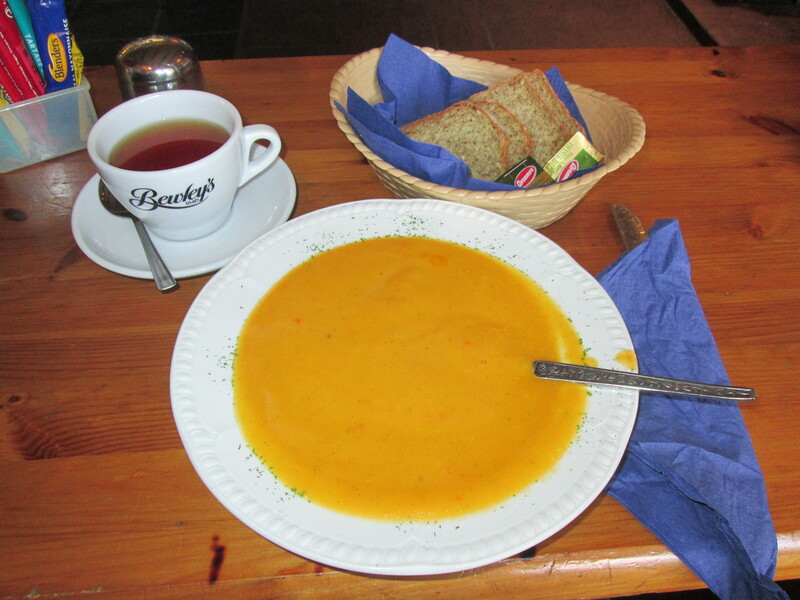 And, it seems that all soups (except chowder) served in Ireland are puree’d, even the vegetable as you can see in the photo. 5.The Royal Society for the Prevention of Cruelty to Animals (RSPCA) was founded in 1824 by Richard Martin, an Irish politician and one of the first animal rights activists. 6. In the late 18th century, Cork was the largest exporter of butter in the world, mostly to Britain and the British Empire. 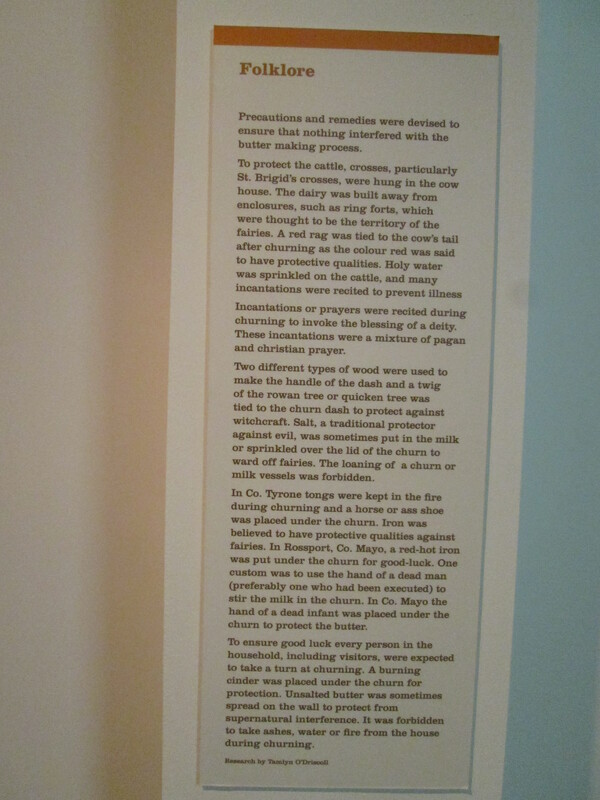 It was interesting to me to find that when I visited the Butter Museum in Cork, to learn that when the Irish dairy community wanted to expand their exports (which had been primarily to Britain) the British said it was not a good idea. Ireland now exports KerryGold dairy products to 81 countries worldwide. 7. There are NO postal or zip codes in Ireland, except in the city of Dublin. 8. Ireland was the last country in Europe to permit divorce. It was narrowly approved by a 1995 referendum when only 50.28% voted in favour (this was three percentage points more than at the previous referendum in 1986) and the first-ever divorce granted in Ireland was in 1997. Irish law allows couples to divorce only if they have been living apart for four years. 10. There are more mobile phones in Ireland than people. Ah, tis my kind of country! It could be, but you would need a spouse from there! Love it! So many interesting facts. I was able to take a trip and not leave my desk. Thank you for your adventurous spirit my friend!